Island visited by 62 members. This name has been misleadingly anglicised as if it contained the element cruach, 'stack'. It actually contains cró, 'sheep-pen', and it seems that the name has been transferred from a pen to the hill on which it was situated. An Cró Mór is the 1174th highest place in Ireland. What an idyllic spot ... especially so when the weather is pleasant! Looking north west down the Green Road, from just above the pier, to the handful of habitable of dwellings that look out over the pristine beach. Local lore has it that Peig Sayers lived in one of these houses, as opposed to the smaller ruins to the right. It looks most likely they have been improved and expanded somewhat since her day! The lazy potato beds can just be seen on the slope beyond the houses and the island of Inishtooskert can be seen at the top left of the photo. 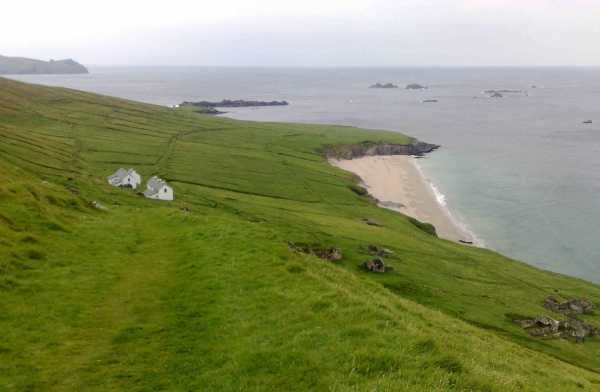 This Green Road leads down the south side of the island and then crosses over between An Cró Mór and Slievedonagh to return via the northern side. The track is mostly good with the odd soggy bits.